This year’s decor is inspired by this porch designed by PBC Design. I love the mix of black and beige and have always been a fan of the color combination. If you follow my Instagram account, you have likely noticed that my own house has this same color scheme. But, before we delve into the details, let’s first take a look at a few maintenance areas for your front entrance. To start with, you want your front door to be in pristine shape. 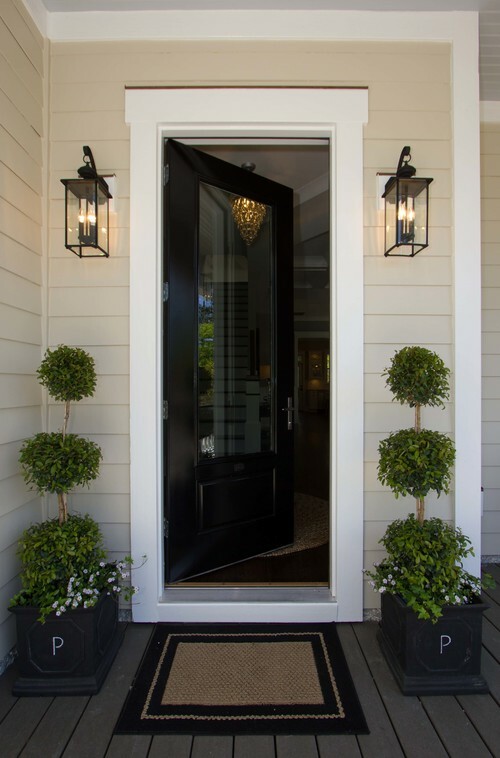 The front door is the central focus of your exterior, and as such, you should check it for worn areas. Last year, I restained my wooden doors and resealed them. If you have wooden doors, check out that post for maintenance issues and how to update wooden doors. If your door happens to be painted, you will most likely be able to get away with just cleaning it. If you want to update the color, take a look at which door color will increase the sale’s value of your home. You may also find some inspiration in that post. While you are cleaning and/or updating the look of your front door, give some extra love to your door’s handleset and/or knobs. It has been touched by hundreds of hands, had grit and grime settle on it, and suffered through the rain and sun all year long. You may be able to polish it in place, or you may need to remove the handleset to do a thorough cleaning. If your doors have noticeable gaps of light or if they are rubbing when you use them, you can do a quick repair job with these easy to follow instructions for door alignment. This will not only make your doors function properly, but it will also help with your heating and cooling bills. 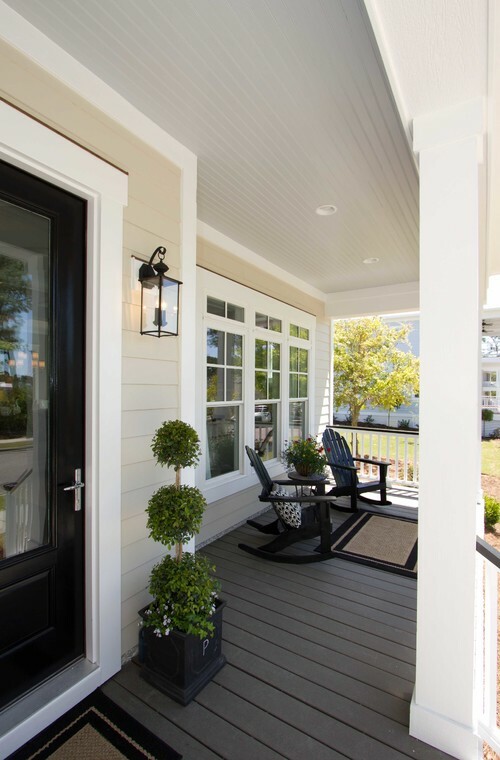 Our inspiration for the springtime porch decor has a crisp and clean vibe going for it. That is just one of the great things about using beige and black combinations. These Adirondack rocking chairs* give a twist on traditional seating, and the black color maintains its clean appearance much better than a lighter shade of paint. More accenting in beige and black tones are added with throw pillows and an over-sized throw rug. Both are designed for outdoor use. Trex decking in gravel path is used for the flooring. Tip – Black seating and decor are best for shaded areas. For areas that receive direct sunlight, consider lighter colors. The color scheme is completed by using a combination of paint colors in neutral tones. In the image above, the siding is finished in Porter Paint’s Moth Gray, and despite the name, it actually leans a little towards beige. The ceiling is finished in Porter’s April Sky, which is a gray-blue shade. Colors may vary in how they appear depending on the time of day and the direction of the porch. Plants are added to bring in some color and to bring life to the porch. Additional options for black and beige outdoor rugs* can be found on Houzz. If you have never shopped with Houzz, you should check it out and see what they have to offer.